Years of Service: 22 Years, 9 Months. Awards: Bronze Star w/”V” Device, Bronze Star w/ 4 OLC, Army Commendation Medal w/ “V” Device, Combat Infantry Badge, Air Medal, Ranger Tab, Parachutist Badge, National Defense Service Ribbon, Vietnam Service Medal, Vietnam Cross of Gallantry w/ Palm, 4 Overseas Bars. Awards – National Guard: Army Service Ribbon, Armed Forces Reserve Medal, Army Reserve Component Achievement Medal, Indiana National Guard Commendation Medal, Adjutant General Staff ID Badge, NCO Professional Development Ribbon, Indiana National Guard Volunteer Emblem, Indiana National Guard Emergency Service Ribbon, ILSM 10 Years. 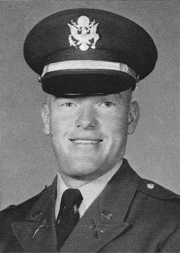 US Army Infantry School, Officer Candidate School, July 1965 – January 1966. Jungle School, Jungle Operations, Fort Sherman, Canal Zone, 1966. CBR School, CBR Operations and Defense Measures, Fort Ord, California, 1968. US Army Infantry School, Ranger Course, Fort Benning, Georgia, 1968. US Army Infantry School, Airborne School, Fort Benning, Georgia, 1968. US Army Infantry School, Infantry Officer Advanced Course, Fort Benning, Georgia, 1971.